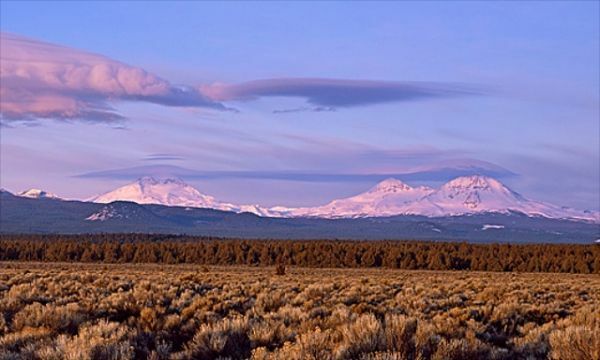 Oregon’s McKenzie River’s headwaters are technically at Clear Lake, located along Highway 126, a common connector between Highway 20 and Highway 242. 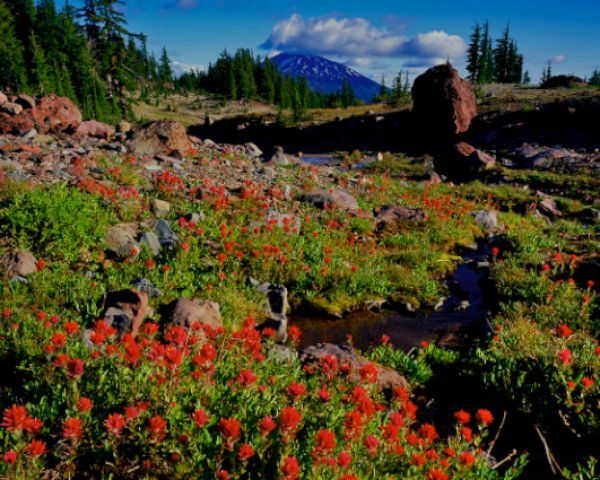 The renowned McKenzie River Trail starts slightly north of Clear Lake where a sign along Highway 126 marks the way on the opposite side of Highway 126 from Fish Lake. Below Clear Lake, the McKenzie River drops precipitously, forming both Sahalie Falls and Koosah Falls. Not far below Koosah Falls, the raging McKenzie River does something bizarre, it disappears. Quite literally, the entire river goes subterranean. 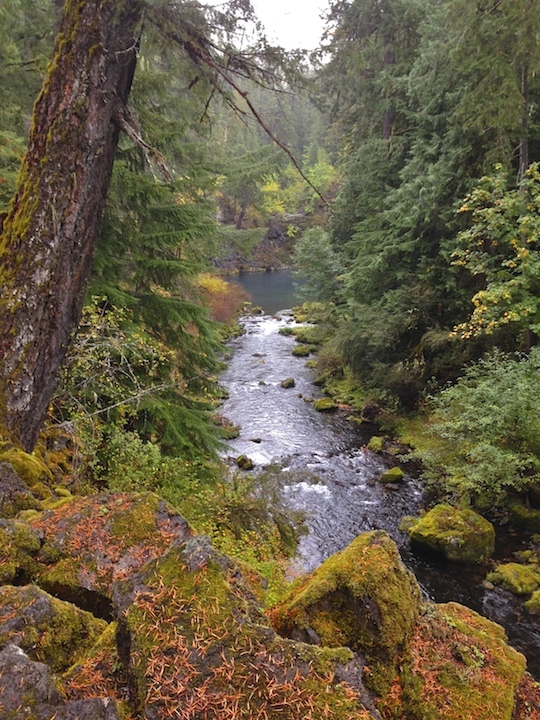 The McKenzie River re-appears several miles downstream at the magical Tamolitch Pool where it upwells in a grouping of large springs. The easiest access point for Tamolitch Pool is at Trail Bridge Campground, located near highway 126. When driving southwest, away from highway 20 on highway 126, the sign for Trail Bridge campground will be on the right. 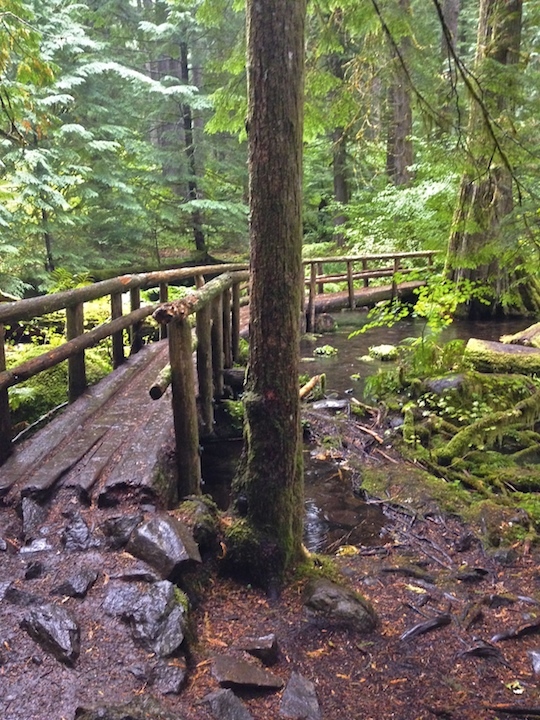 You will abruptly cross over the Mckenzie River on a bridge at which point you should stay to the right until you reach an unassuming parking and trailhead area. 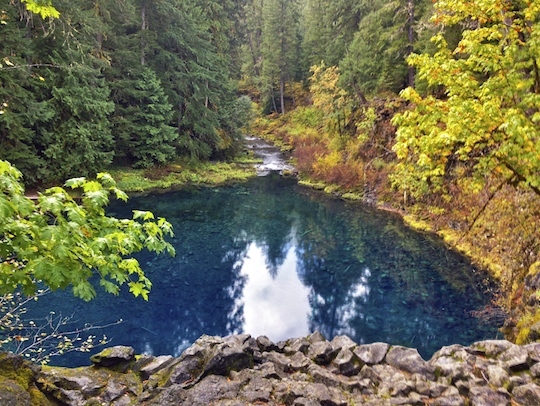 Be ware, the signage at the trailhead area mentions “Tamolitch Pool” and the McKenzie River Trail but it does not mention the “Blue Pool”. The “Blue Pool” is simply a common and unofficial name for the “Tamolitch Pool”…..they are one and the same and you are at the right place! 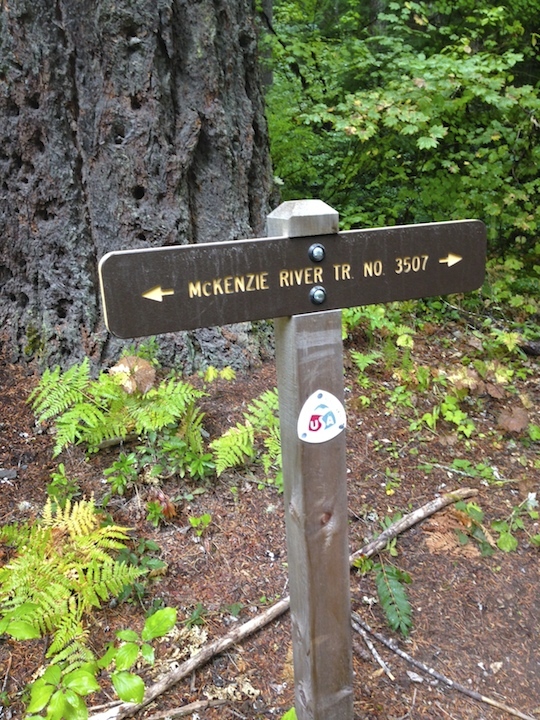 The McKenzie River Trail does not start directly from the parking area. You must continue, on foot down down the road( away from the bridge you just drove across) for about 150 feet and you will see the above signage for the McKenzie River Trail. Go to the right on the trail to hike to the wondrous “Tamolitch Pool”, aka the “Blue Pool”. Initially the trail is flat, simple to navigate and very lush. 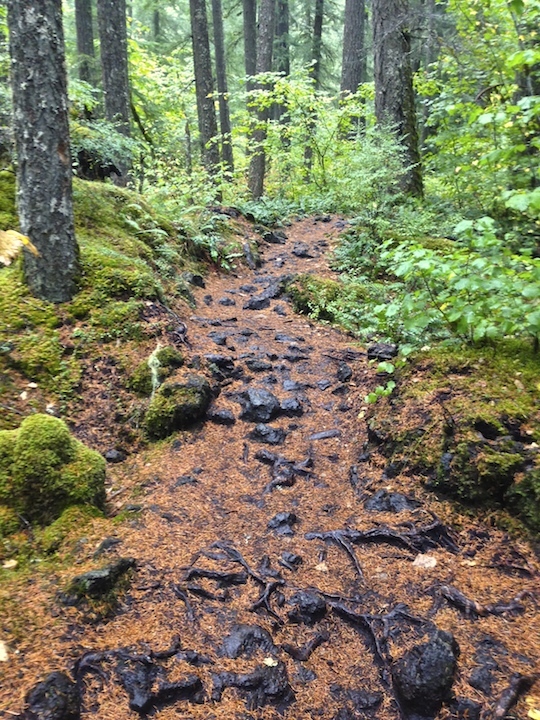 Below is an image of the Trail, just above the trailhead. 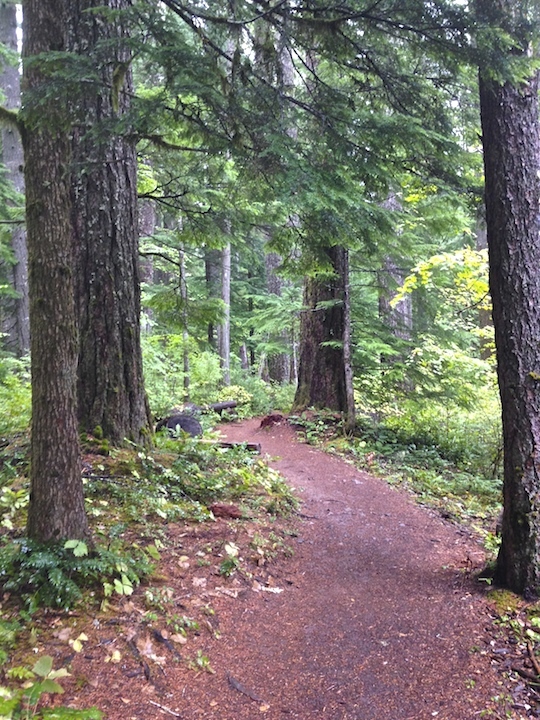 This section of the trail is park like, simple for all hikers and lined with ancient douglas firs and cedar trees. This ultra mild section of trail continues for approximately 1/2 mile until it crosses a couple of tributary streams via obvious footbridges. 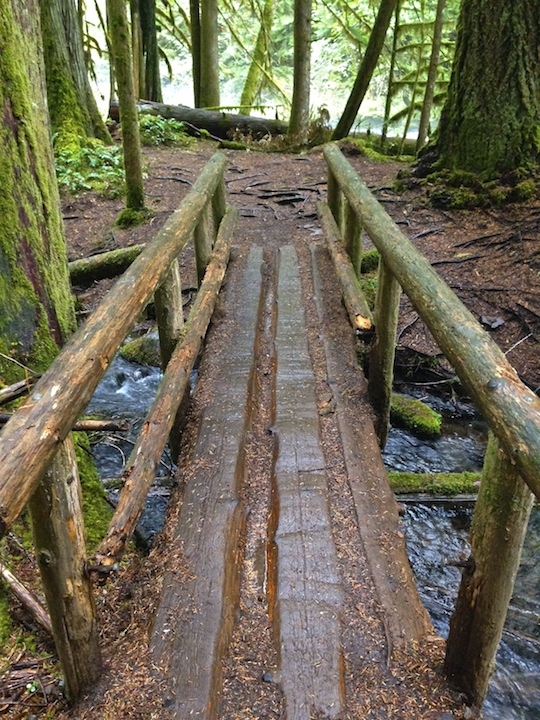 While not modern, the bridges are currently safe for foot traffic. Below is the first of the two footbridges. 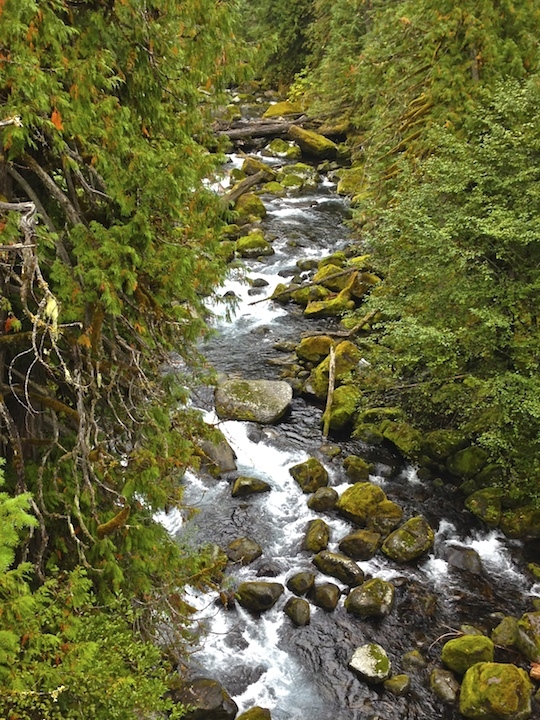 This section of the McKenzie River Trail is quite idyllic with gently flowing streams, rich moist undergrowth, old growth conifers and lots of rich earthy aromas in the air. The second of the two footbridges is seen below. Shortly beyond the second footbridge, the trail becomes more technical and rugged, slowly climbing up an ancient lava flow. 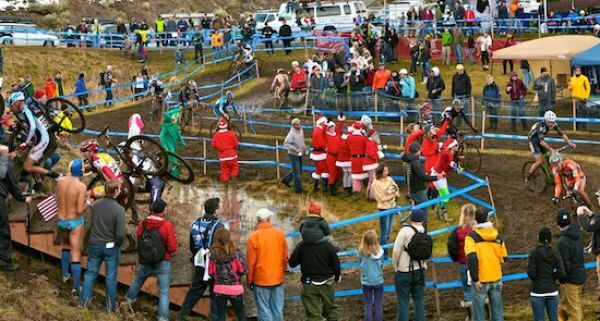 While not dangerous, this section is more than a gentle stroll. This section of the trail continues to climb but not strenuously for over a mile. 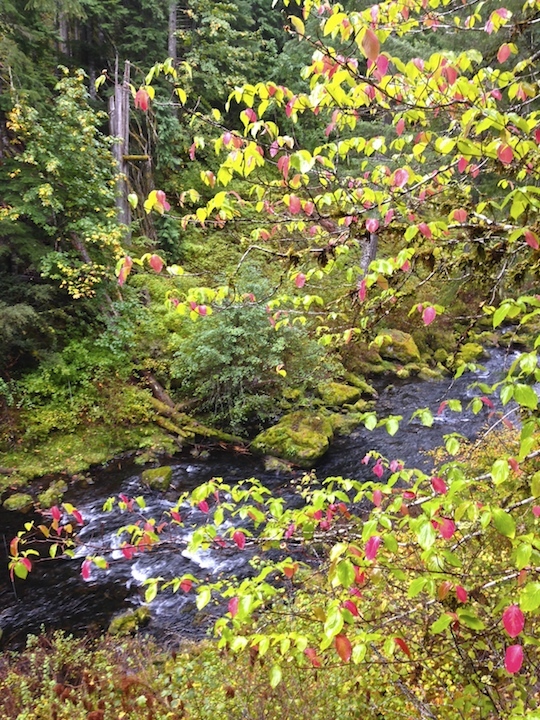 It meanders by several view points of the McKenzie River far below. Approximately 1.6 miles from the trail head hikers will gain their first view of the Tamolitch Pool’s mystical waters. 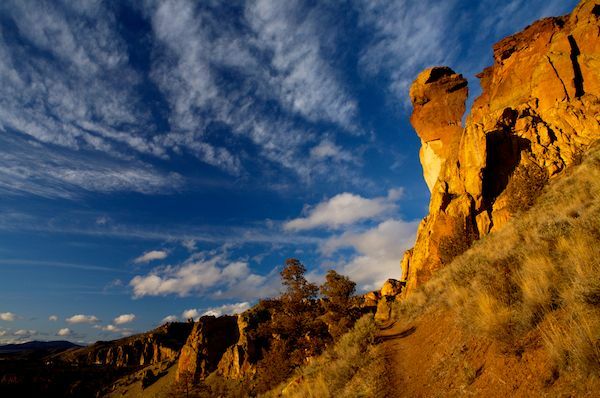 The remaining 1/4 mile to the Tamolitch pool is filled with good view points with beauty both upstream and down. 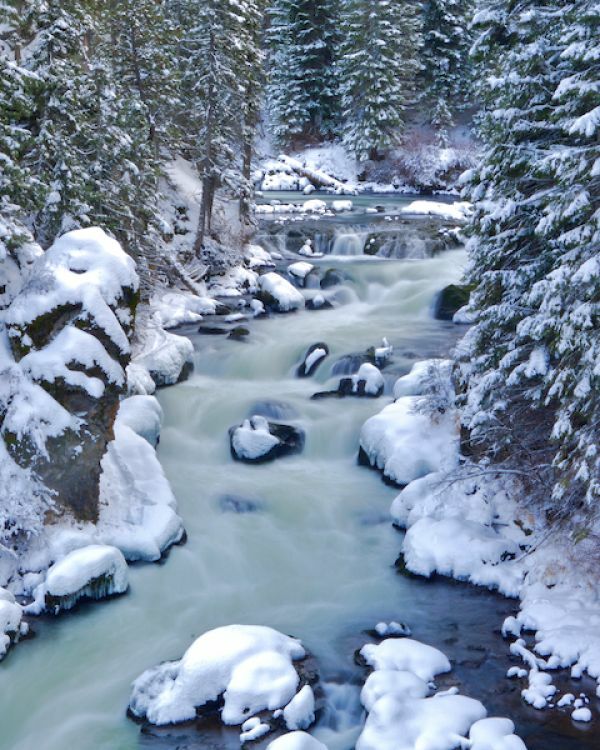 Below is the view downstream from the Tamolitch pool. Your arrival at the Tamolitch Pool will be obvious. If the lighting conditions are optimal, you will witness the bluest water you’ve ever seen. I highly recommend a scramble around the pool to observe it from both sides. The scramble is off trail and not for all hikers but it is beautiful. The deep turquoise waters are stunning and the water clarity is remarkable. On the upstream side of the Tamolitch Pool is a prominent 60 foot cliff. In the middle of the cliff is a small treeless area where there is a waterfall during times of extremely high precipitation. Below is a view of the Tamolitch Pool from the treeless area, downstream. The water in Tamolitch Pool is amazingly clear exposing stunning detail 70 feet below its surface. More adventurous types have been known to jump off of the cliff into the Pool far below.j This NOT for everyone. The jump is a dangerous one and the spring fed water far below is frigid. At least one person has tragically died after jumping into Tamolitch Pool, so beware. If you scramble to viewers left, down to the edge of the pool, there are some excellent resting/pic-nic areas. The Tamolitch Pool experience is more than the water, it is about the natural composition of the place. It is simply magical. Old growth trees, strikingly blue water, infinite detail in the pool’s bottom, rich mosses, gorgeous fall color, upwelling springs roughening the pool’s surface and the gentle re-birth of the beautiful McKenzie River as it gently flow out of the Tamolitch Pool and grows into one of the most beautiful rivers anywhere. To view a truly gorgeous Fine art Photograph of the Pool visit Tamolitch Pool. From here, you simply hike back in the opposite direction. The total distance to Tamolitch Pool from the trailhead is slightly more than 2 miles, so allot your time appropriately. 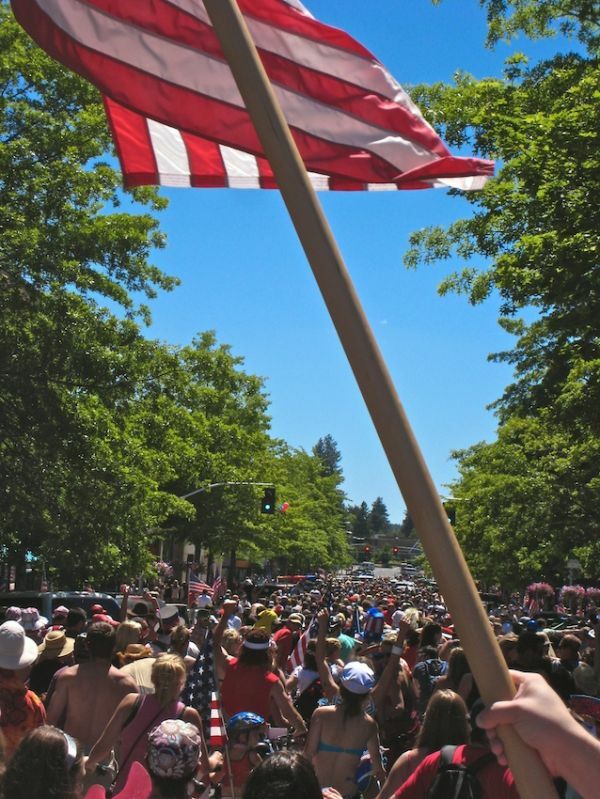 As alway, please take out any debris you brought in and better yet pick three pieces of debris you did not bring in. If every hiker did this, every trail would be spotless!